One of the most enduring debates in education concerns ‘standards’ in primary and secondary schools. Literacy, numeracy and science form the backbone of the school curriculum with the intention of equipping pupils with these core skills by the time they leave school. 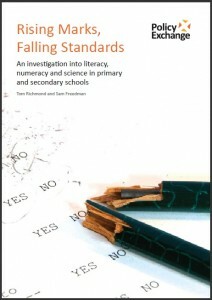 The purpose of this report is to investigate the extent to which literacy, numeracy and science have improved since 1997 with a particular focus on SATs at age 7, 11 and 14. Through a detailed analysis of national school performance data, a number of serious concerns are raised with regard to the current state of pupils’ core skills. In addition, the curriculum from the ages of 14 to 16 – which includes GCSEs, Diplomas and Apprenticeships – is assessed in terms of its rigour, complexity and credibility. We also put forward our recommendations for the future direction of primary and secondary education, including a new model for SATs, more freedom for schools in how they teach core skills and creating a better set of academic and vocational options for pupils at age 14.